Chandigarh, the union territory of India which is also the capital of Haryana and Punjab, is a well-planned city that was designed and executed in the hands of Le Corbusier and the former PM of India, Jawaharlal Nehru. It is one of the cleanest cities of India that is home to trendy, fashionable youth whose style statement can be seen on the streets of the city. Lofty skyscrapers that are spread throughout enhance the beauty of the city. A getaway from the bustling city of Delhi to the cheerful Chandigarh can be a great idea for a weekend, since it is located just around 250 km from the city. The route from Delhi to Chandigarh is dotted with places of Hindu mythological significance that will surely kindle the history buff in you! The best time to visit Chandigarh is during the fall, between August to November. However, the weather in Chandigarh is much similar to Delhi. The ancient town of Panipat is believed to have been founded by the Pandavas of the Hindu epic, Mahabharata. Apart from being famous for a rich history, Panipat is popular for its food, culture, spices and textiles. The town is located 85 km from Delhi and is the first place of interest found on the way to Chandigarh. Some of the monumental places you must visit on your stop at Panipat can be Ibrahim Lodhi's Tomb, Kabuli Bagh Mosque, Panipat Museum, to name a few. Karnal gets its name since it is believed to have been founded by Karna, a mythological character from Mahabharata. It is fondly known as the Rice Bowl of India due to the production of rice that takes place in the fertile banks of river Yamuna. Karnal is 117 km from Delhi and 35 km from Panipat; the places you can visit in the town include the beautiful Karnal Lake, Karnal Fort, Cantonment Church Tower, etc. Popularly known for being the battlefield of the epic Mahabharatha, Kurukshetra holds a high importance in the Hindu history. The holy town that is dotted with shrines and temples is located 40 km from Karnal. Apart from the war, Kurukshetra is significant since it is the land where Lord Krishna preached Lord Arjuna and created the Bhagavad Gita. You can visit places, such as Brahma Sarovar, Krishna Museum, Bhadrakali Temple and Sthaneshwar Mahadev Temple, while you're in the town. Read on to know about the places to visit in Chandigarh. This beautiful reservoir that is found on the foothills of Shivalik Hills, is one of the most sought-after recreational sites of Chandigarh. Designed by Le Corbusier, Sukhna Lake is a favourite amongst both tourists as well as the city folks of Chandigarh. You can watch the beautiful sun setting or go for an early morning jog around the lake. Boating is an activity available for all in the lake. Chandigarh is spread with numerous gardens that will rejuvenate your mind and soul with their mesmerising beauty. Zakir Hussain Rose Garden, Botanical Garden, Terraced Garden are some of the stunning gardens of Chandigarh you must visit. 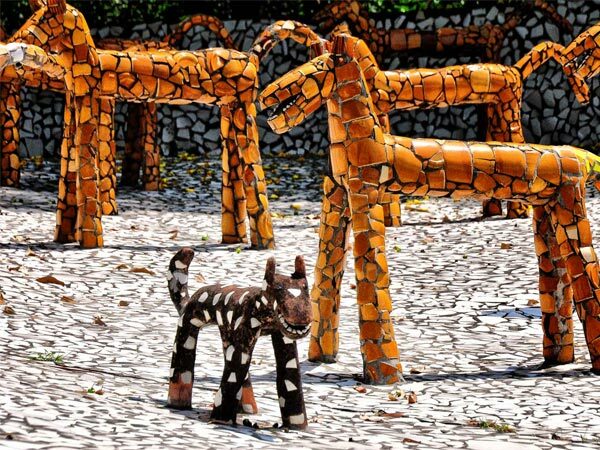 Nek Chand's Rock Garden is a unique place to explore, since it is a sculpture garden that houses art that is made of industrial waste, such as plastic, glasses, etc. and of course, rocks.